Its amazing to see so many of you on board with the #JonahChallenge! Even those that haven’t done the previous Bible Challenges we welcome you! For those that still don’t know what it is, don’t worry! 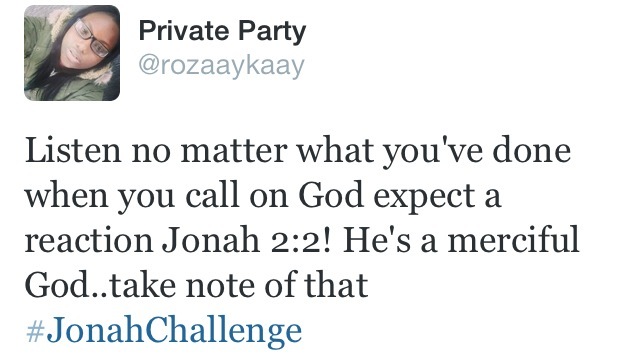 The Jonah Challenge is a FOUR day challenge, where we read the 4 chapters in the book of Jonah in the Bible! It is not just about reading, I would love for us to share our understanding of what we have read with each other, so as you read, feel free to hashtag #JonahChallenge if you have twitter. In addition, please email biblechallenge@outlook.com with your notes for each chapter, or a summary and I will put it up on this blog page! The book of Jonah really focuses on our attitude to God, disobedience, God’s mercy and our carnal fallacy. Especially in the area of OBEDIENCE which I believe is so key in really getting the most out of our Christian walk and abiding in God’s will for us! Some points I haven’t touched on in my summary are covered in everyone else’s contributions, OR I have purposely left out to encourage you guys to touch on! So Lets Go! Matthew 12:40 affirms the fact that the story of Jonah is true, because Jesus himself said it was! For as Jonas (Jonah) was three days and three nights in the whale’s belly; so shall the Son of man be three days and three nights in the heart of the earth. Afflictions and storms cause us to be totally and unwaveringly dependent on the only ANCHOR that can fight waves – GOD. Don’t run, stay grounded, Pray and hold onto The Anchor! There is a beautiful Hillsong Song called Cornerstone and in one of the verses the lyrics are ‘My anchor holds within the veil’. This is the hope that every Believer has, that no matter the storm, our Anchor being God, will hold! God really didn’t play about with this one. It shows how important our obedience is to Him. We are living in a day and age where we have become sooooo relaxed in our dire state of disobedience. Let this story of Jonah be a wake up call for all of us. 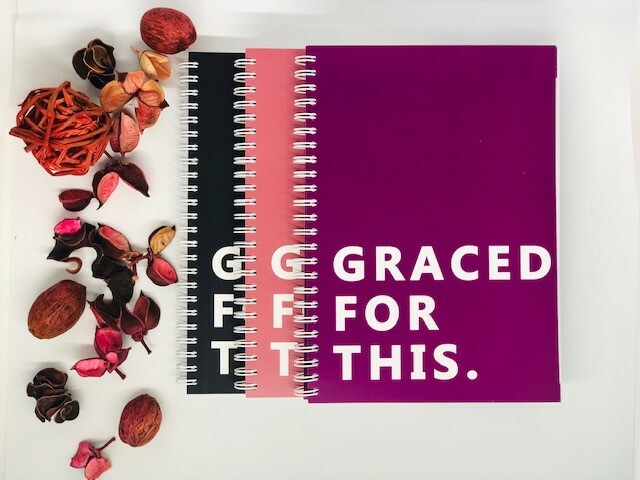 God’s grace isn’t to be taken for granted. God’s grace is good; but don’t take the mick! God is not mocked, neither is he a mugu! The ‘Gospel of Grace’ does not exclude the righteous from being judged; in fact the first scripture below shows that judgement starts with us!! A few scriptures to really meditate on! Some of them are REAL Peak ohhh! Jonah had faith that God heard his prayer and delivered him from his situation! From verse 1-2, I deduce that he believed his prayer was answered before he was ‘actually’ delivered. We need this type of faith, storm or no storm! We need to believe that God hears our prayers and will answer according to His sovereign will! 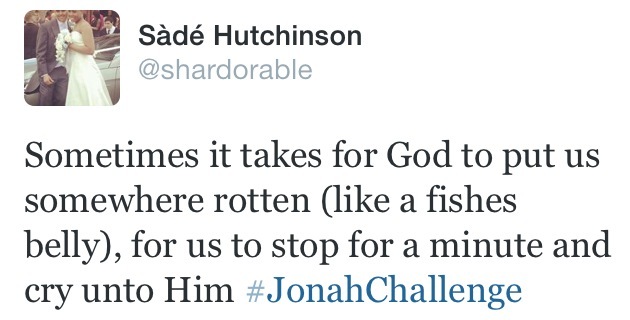 Remember Jonah spent 3 days in that fish! Most of us would have given up after day one. I’m not wrong in assuming that Jonah persevered, seeking God’s answer, turning His heart to God’s temple. They are annoying plants, if you have a garden you would know. Weeds are basically skilled in growing anywhere & everywhere that weed killer does not exist! Weeds grow aggressively! Now Kanayo where are you going with this? To me those weeds are the negative maladaptive thoughts, cognitions that grow in the absence of the weed killer – The Word of God (John 1:1), God, Fellowship etc. God’s word is a sword, ‘shank’ every thought that is impure as Jahaziel’s song says. Take captive every thought, don’t allow it to grow! Fellowship is so important. Lack of fellowship with others leaves you vulnerable on a spiritual level! The mathematics of the bible shows how important fellowship is! When Jesus started his ministry, what did he do? He found himself disciples, varying in kind and occupation! 12 to be precise. When God created the world, who was with him? The Holy Spirit, the counsellor, WISDOM. Adam was given to eve. Daniel rolled with his mandem ohhh! When the guy who was demon possessed with ‘legion’ inside of him. The bible clearly states that he rolled on is ones, it was until Jesus and his crew came that made the demons inside him quiver and shift well under the authority of Jesus’ words. Our minds can be our greatest enemy! Jonah is a reflection of our human fallacy. We can all laugh haha and say we don’t know what Jonah was thinking trying to run from God, but the truth is…we’d do the same. 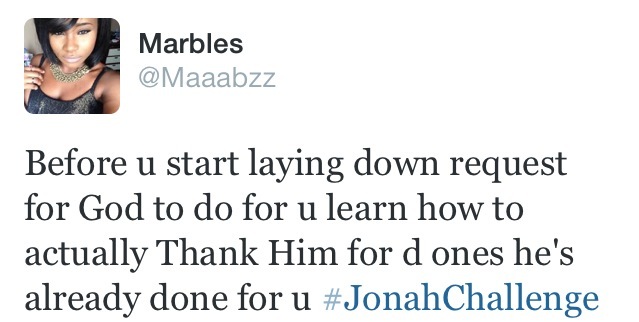 Thankfully, we can learn from Jonah and NOT make that mistake. Why do we leave it so last minute? Why do things have to get rough before we turn to him? 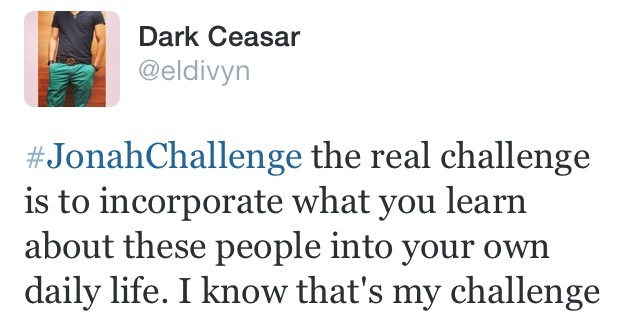 Pause for thought! My Song as an encouragement to Praise God through everything! 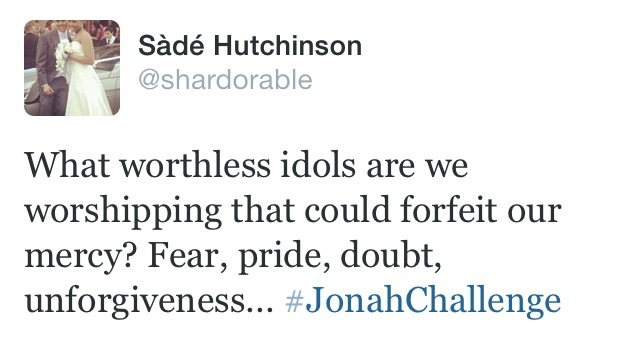 I don’t believe Jonah wanted to run away from God but I guess fear caused him to do that. I believe in this time of prayer he realised he shouldn’t have ran away from God. 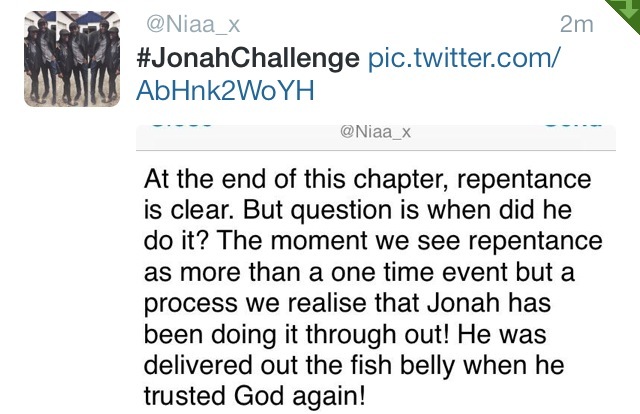 In the past chapter, Jonah was running ‘away’ from God. Here we see him running ‘to’ God. He’s crying to God in prayer to deliver him. 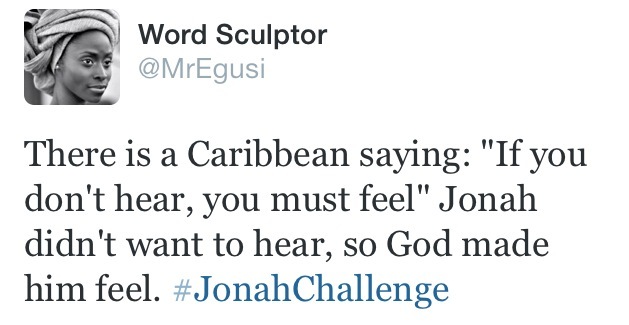 Many of us are like Jonah. It’s when pain and affliction comes, we remember to run to God. Even when this adversity may have been a result of our wrong doings. Let’s cultivate the habit of running to God at all times, through the good and the bad. Wherever you are, He’s ready to uphold you. We also see Jonah opening his heart to God. He is grateful to God for saving him from the perilous depths of the sea and also for mercy. Sometimes it takes a terrible experience for some of us to open our hearts up to God, to realise He is our only hope. It really doesn’t have to take one. Remember He’s our father, we need to be open with Him; He knows us inside out. He disciplines us because He loves us. Like Jonah, we KNOW we are doing something which may not reflect Godlike behaviour or we KNOW we are being disobedient, however when the going gets tough we seem to disregard the fact that we were the ones who didn’t reach expectations but we are quick to call on God. Jonah was so quick to run from God’s orders yet once he was in trouble he was ready to call onto God… which I can see it is a bit like some of us. But luckily for us (and Jonah [Jonah 2:10]) we see God’s grace at its best. Even though we can be disobedient at times and we get ourselves into situations which we know we can’t get out of by ourselves, by recognising our wrongdoings and asking God wholeheartedly for His grace and mercy we know that we can overcome all things. In Jonah 2, I immediately see the power of God and the power of prayer shining through. Jonah 2:4-6 Jonah’s prayer shows how herealises he can’t run and he can’t hide and worst of all he is completely powerless. However from verse 6 onward Jonah appreciates God’s power and the fact that he can do ALL things. Wow! I’m actually trying to picture myself inside a fish. That would be the scariest thing ever! 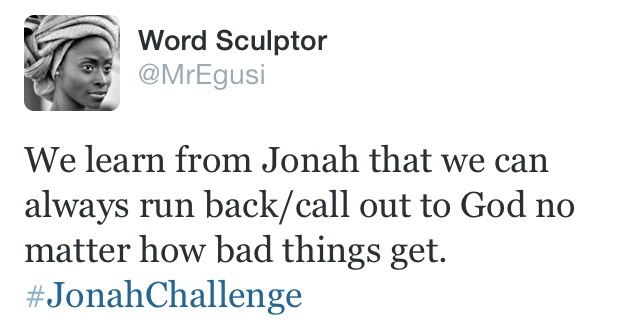 The way Jonah described the course of events.. It seemed so terrible! He truly suffered (vs 3-6) & that’s just a pity because he allowed calamity upon himself. If only he had obeyed, none of that would have happened to him. As I read, I wondered why the fish didn’t eat Jonah up…that was God at work. I used the inside of the fish to basically describe a world of sin. It’s as if one is trapped inside a ball. But all glory to God for the opportunity to be saved. – This chapter focuses on Jonah recognising his own spiritual state. 2 Corinthians 13:5, Examine yourselves to see whether you are in the faith; test yourselves. Do you not realise that Christ Jesus is in you – unless, of course, you fail the test? Jonah had failed this ‘test’ up until now. – We may find or selves in the most peculiar of situations, & in Jonah’s case, it was being in the belly of a fish, but the Lord will still hear our earnest cries. Jonah recognised he was dead spiritually ( “belly of Sheol”) – Jonah knew that even though he had wandered away from The presence of God, he could always return back to Him. – He speaks about how he is in the lowest and darkest place in his spiritual life, YET even in all his corruption the Lord is still keeping him. There are time we do so many thing that are contrary to the will of God and have even got into situations that should not permit us to be alive, YET God still sustains our lives , only due to His love and Hid mercy. – Jonah made his own selfish desires precedent in his life over the power of God. This became his idol. 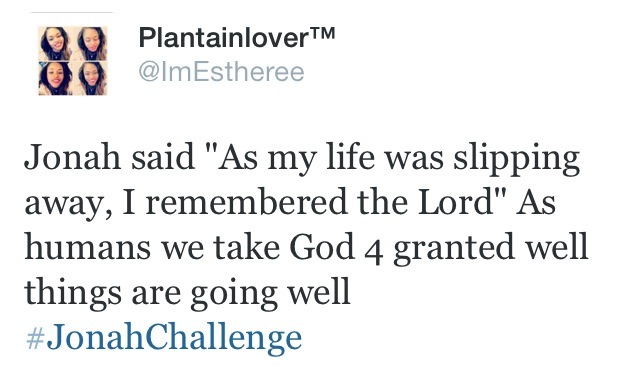 But he now realised that all the things he put before God are WORTHLESS and fickle in comparison to God. We NEED to die to self and surrender our whole being to God, and complete the work He has commissioned us to do. – ONLY when Jonah put his desires secondary to the will of God for his life was he able to receive deliverance from the belly of the fish. It is only until we surrender and realise how powerless we are can we gain victory in Christ Jesus. Philippians 2:13, For it is God who works in you to will and act in order to fulfil His good purpose. – Jonah failed to repent at an earlier time due to his lack of faith and trust in God. “Earth with its bars closed behind me forever (verse 6): Friends, families and things of this world may disappoint us but Yahweh is always there for us. He got our backs even when we don’t think about it. He brings us back to life. Prayer of Thanksgiving. Remember your vows, promise and covenant with God and pay them- not monetary. Verse 2 also reassures us that God not only hears our prayers, but he answers them. If he can hear and respond to Jonah’s prayer, then why wouldn’t he do the same to us? God has no favourites (Galatians 2:6). Next time you are in a dark situation, remind God that He heard and answered Jonah, and ask him to do the same to you.